There is no time to celebrate. For most new pilots, career advancement means flying 1,500 hours as fast as possible. Having a nice view is one of the daily thrills of flying professionally. 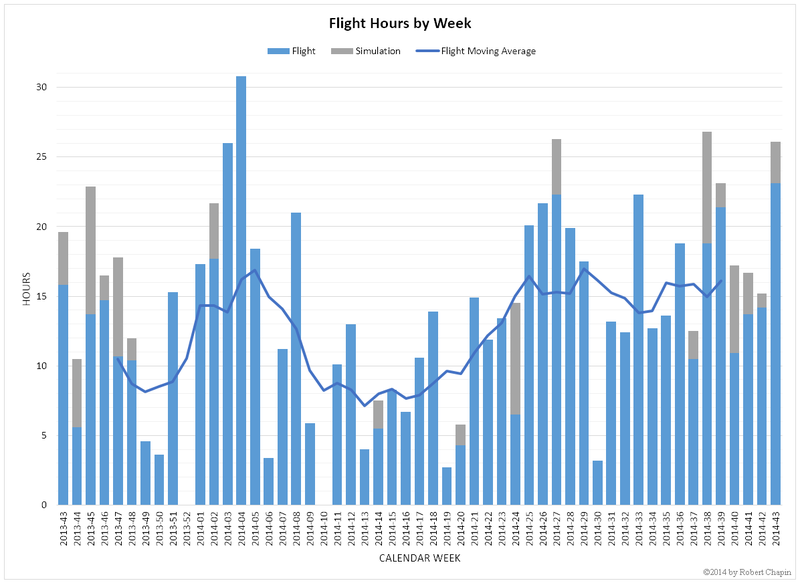 Work weeks fluctuate, totaling 700 hours dual given. At the start of 2014, I already had a few months experience instructing instrument students and I was just getting my first taste of Texas winter weather. Since then, most of my students are of the first flights variety, working on their first landings, their first stage checks, their first solos, and their first check rides. The work routine is the same, but the flying is different. I now have 475 hours logged in Cessna 152 type airplanes. I’m not sure this is the variety of extra experience Congress had in mind when it mandated six-times higher experience requirements for new airline pilots. These airplanes are old, barely fit two people, and won’t fly much further than 300 miles before a planned fuel stop. The experience gained here has more to do with the strong sense of self preservation that comes from allowing students to fly within the margins of safety of an airplane’s legal and physical limitations, and quickly taking control of the airplane when it looks like the student is going to test those limitations. Anyone following my articles about the experience minimums for airline pilots should have the impression that the new R-ATP regulations are not working well for recent college graduates. I predict the R-ATP certification process will work wonderfully around four years from now when today’s freshman class has successfully navigated all the loopholes and pitfalls. In the meantime, the current patterns will continue with each pilot needing a different amount of experience and most pilots remaining ineligible for the reduced minimums. As I predicted in January, I still do not expect to be eligible for an airline job before reaching 1,500 hours. Most likely, I will be a 61.160(f) applicant with between 300 and 500 hours of cross country experience. I also predicted reaching 1,000 hours total within 4 to 12 months. It now looks like I will reach 1,500 hours within another 5 to 9 months. Optimistically, that means May 2015. The winter months should be much more comfortable this season because I did achieve my goal of being cash flow neutral with my current flying job. My monthly expenses are actually less than my net income now thanks to pay raises, increased flying hours, a new roommate, and the sale of my former home in Michigan. If I were to add up all of the incomes and expenses since moving to Texas, I think I would be near the break even point now. This is an important turn of events. There was a long stretch around April when I was bringing home less than $800 per month and paying out more than that just to keep an apartment near the airport. Reliable positive cash flow is very important to me, and it reflects well on the company when flight instructors can survive financially while working to accumulate hours for logbooks and résumés. Applications and interviews for regional airlines will begin soon. The job market is interesting. At the entry level, many of the regional airlines are desperate for new hires. Some recruiters try to hide this fact under a pretense of business-as-usual, while others seem like high-pressure salesmen trying to convince me to buy in to a big ticket item. Above entry level, the market looks very different. Regional and major airlines are clinging to their pilots for as long as possible, making it difficult for experienced pilots to upgrade or switch jobs. For me, the challenge is understanding how all of this will change over the next six months. Airlines I’m interested in today could be growing quickly or out of business by the time I’m ready to accept an offer. Where should I apply first? Which job would I enjoy most? I am carefully weighing the possibilities. One thing I’ve already learned from preparing job applications is that there is a better way to make a digital logbook. Pilots know a digital logbook is a necessity now because it automates the task of adding up the experience numbers for résumé line items and makes it easy to check the accuracy of a paper logbook. As I was reviewing my own web-based logbook, it occurred to me that these digital logbooks are terribly simple. The log itself is equivalent to a single spreadsheet file, and the searching and reporting capabilities are the same features that come built in to Microsoft Office. Over the course of just two hours, I was able to import my digital logbook to a new MS Access file, customize it to match my paper logbook, recreate exactly all of the reports that I need, and for a fancy twist I “normalized” the column of tail numbers so that the aircraft are managed separately. 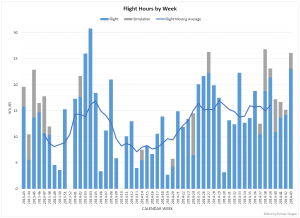 The chart I made for this article was generated by clicking a custom button for reporting weekly totals. The logbook summaries I want to bring to my interviews are fully customized and laser printed with just another click of a button. Having my own logbook solution is more empowering, more secure, and less expensive than any “cloud” service or iPad app. I am looking forward to 2015 with great excitement, and enthusiasm for the hard work ahead. Although the 14-hour shifts often take me away from routine errands and things like blog updates, I am always happy to have positive results in my logbook and significant progress toward my long term goals. I will post another career update near the 1,500 hour mark.